ON February 3, 1986 Father Ken Barker joined with four young men in Kaleen, Canberra to begin a common life of prayer and service. By December 1992, Archbishop Francis Carroll of Canberra – Goulburn Diocese erected and approved the Missionaries of God’ s Love as an Association of Christ’s faithful with the signing of the Constitutions. Numbers of young men were attracted to the life of service as missionary disciples under the grace of the Catholic Charismatic renewal. Formation as priests and brothers continued as numbers joining increased. Their apostolate was to evangelise young people. On February 8, 2013, a new religious congregation in the Australian Church – a religious institute of Diocesan Right – was erected. Father Ken its Moderator continues to teach, inspire, guide and discern applying his rich background of spirituality, scripture knowledge and understanding of human nature while being intently tuned to the voice of the Holy Spirit in today’s Church. 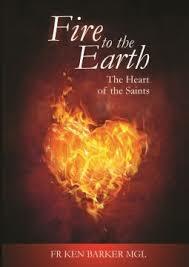 His seventh book Fire to the Earth contains meticulous research on the life experiences of ten canonised saints whose spiritual theologies are foundational to the charisms, prayer life, preaching and mission of the MGL who now minister as missionary disciples in overseas and Australian contexts. It is an established fact that the spiritual formation of priests, religious and laity draws inspiration form the lives of holy men and women irrespective of their culture and historical period. eteenth century is to teach and inspire through their example of dedication, perseverance and commitment. The spiritual experience of each saint is unique. Some saints founded religious orders as people were attracted to God’s purpose being outworked in their lives. Some give us models of prayer and patterns for meditation on scripture. Others emphasise God’s passionate love for humanity and His abiding gentle presence while the lives of several exemplify the slow “movement towards living the will of God in all circumstances”. All respond to the appeal of the Gospel to evangelise while remaining dedicated to prayer and obedient to the promptings of the Holy Spirit to continue the mission they believed God had summoned them to embrace. Despite severe trials and uncertainties and sometimes doubt they persevere confident in God’s providence God and showing mercy and compassion for the poor, alienated, oppressed and marginalised. Their lives reveal a passionate love of God with “hearts on fire with a burning desire to proclaim the Good News” in season and out of season. They draw spiritual nourishment from the Scriptures and in certain instances attend to the inspired teachings of holy men and women of previous periods of Church history. Fr Ken notes the difference between the saints’ understanding of God’s spirit working in their lives and the reality of “knowing the joy and presence of the Risen Christ where love for Him desires to overflow in sharing the Good News of Gods’ saving love with others”. While the saints’ lives were context bound both socially and culturally their emotional and spiritual experiences speak powerfully to the hearts of people open to the Holy Spirit. Formational teaching for Christian discipleship is clearly identifiable through Father Ken’s masterful analysis of the spiritual theology embraced by the saints. This remarkable book highlights practices of spiritual wisdom “to facilitate personal growth for evangelising” with reliance on God’s mercy, compassion and providence to sustain and direct. It contains knowledge distilled through prayerful reflection and human experience over many years. Highly recommended and obtainable from St Pauls Book Centre, Elizabeth Street, Brisbane.